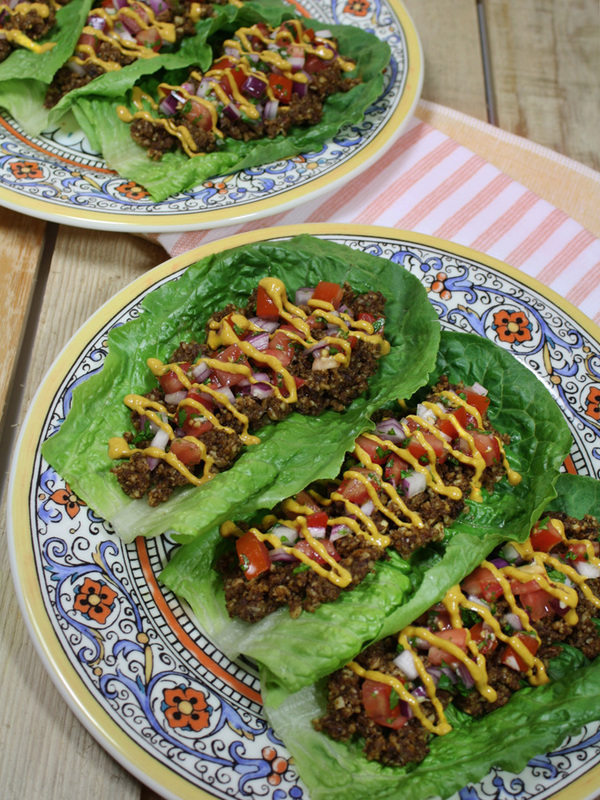 Continuing with the Mexican raw food theme, today I give you raw vegan lettuce leaf tacos! These are quite easy to make, and the walnut taco meat can be used for many raw vegan Mexican dishes. It may seem light because of the lettuce leaf instead of the traditional tortillas, but the hearty walnut taco meat is quite filling, so it makes a delicious and satisfying meal. Walnuts are high in Vitamin E, anti-oxidants, omega 3 and 6, and protein, so with the combo of pico de gallo and lettuce, it’s loaded with vitamins, minerals, and anti-oxidants. Totally healthy tacos packed with flavor! Now let’s get right into it! First, we start with the walnut taco meat. If you have a dehydrator, soak the walnuts for 6-8 hours, rinse well and drain. Then dry them in the dehydrator on 115℉ (46℃) for about 18 hours until completely dry. If you don’t own a dehydrator, even though it will no longer be raw, you can lightly toast the walnuts in a dry skillet until they begin to smell fragrant. Set aside and cool off. If you don’t have walnuts on hand, you can use other nuts or seeds. I make these with sunflower seeds when I’m out of walnuts. Soak the sun-dried tomatoes in water to soften. Drain and roughly chop them up. Add all the ingredients for the walnut taco meat into the food processor, and pulse until the walnuts become the size of ground taco meat. Do not process too much. It should look like crumbles. If you process it too much, it will become more like a taco meat paste! I usually make extra so I can make it into taco salad, burrito bowls, and other various Mexican style dishes. It’s a great staple and versatile topping to have on hand. 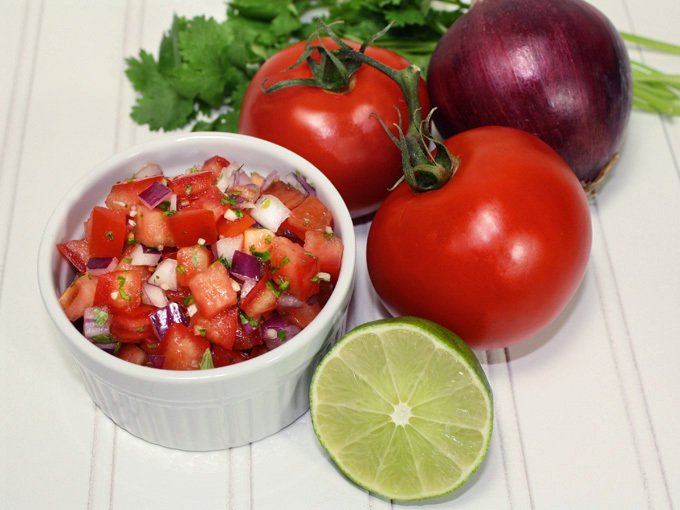 Next we prepare the pico de gallo, by simply tossing together diced tomatoes, diced red or white onions, minced garlic, roughly chopped cilantro, finely diced jalapeno, salt, and lime juice. Rinse and dry off the lettuce leaves, and cut the ends off to fit your plate if needed. I used romaine lettuce here but you can use cabbage leaves or chard leaves. Purple cabbage makes a stunning taco display. Line it up on the plate, and place about 1.5-2 Tablespoons of the walnut taco meat onto each leaf. Top it with some pico de gallo. You may also add some guacamole or sliced avocados. I usually add guacamole, but for the pictures, there was too much green going on! So I omitted it. 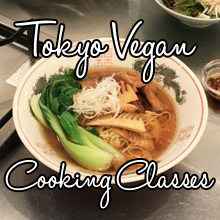 Finish it off with a drizzle of raw vegan nacho cheese sauce. “Oh my!”, (in my best George Takei voice!) Who wants some raw vegan lettuce leaf tacos? Me me me!! Soak the walnuts for 6-8 hours, rinse well and drain. Dry them in the dehydrator on 115℉ (46℃) for about 18 hours until completely dry. Lightly toast the walnuts on a dry skillet until they start to smell fragrant. Set aside and cool off. Soak the sun-dried tomatoes in water to soften. Drain and roughly chop. Add all the ingredients for the walnut taco meat into the food processor, and pulse until the walnuts become the size of ground taco meat. Do not process too much. It should look like crumbles. If you process it too much, it will become a taco meat paste! Dice the tomatoes and onion. Mince the garlic and jalapeno. Roughly chop the cilantro. Add salt and lime juice and toss together. Rinse and dry off the lettuce leaves, and cut the ends off to fit the plate if needed. 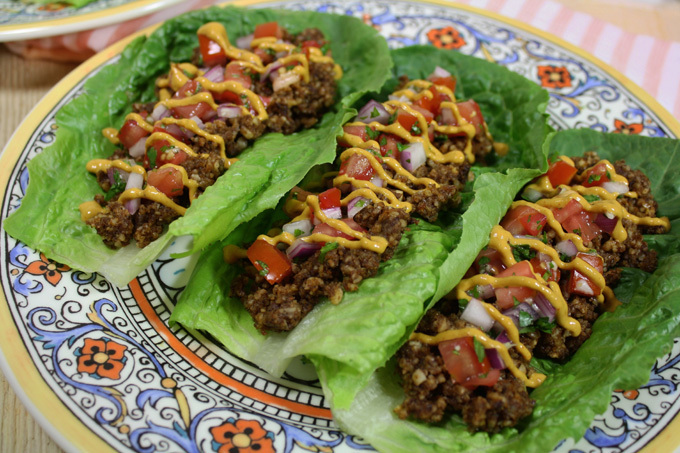 Line it up on the plate and place about 1½ - 2 Tablespoons of the walnut taco meat onto each leaf. Top with some pico de gallo. You can also add some guacamole or sliced avocados. Finish it off with some drizzle of raw vegan nacho cheese sauce. If you don't have walnuts on hand, you can also use other nuts or seeds. I also use sunflower seeds when I'm out of walnuts. Store the walnut taco meat in the refregirator in an air-tight container. Will keep for 5 days.